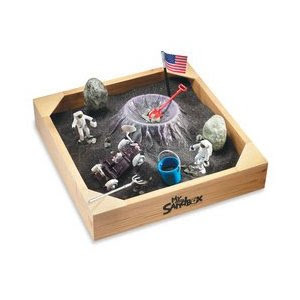 Space Patrol includes 10"X10"X2" wooden sandbox, 10"X20" no mess play mat, ultra fine sand, 2 astronauts, crater, moon rover, digging shovel, grooming rake, bucket, 2 asteroids, and moon rocks! 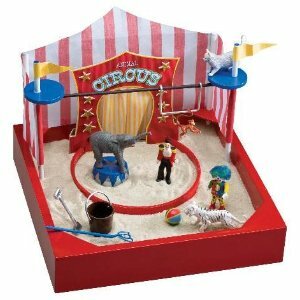 Circus Time includes: 10"X10"X2" sandbox, 20"X20" no mess play mat, ultra fine sand, elephant, white tiger, swinging monkey, tight rope cat, clown, ringmaster, ball, elephant stand, circus stage with ring, rake, shovel, and sand pail! 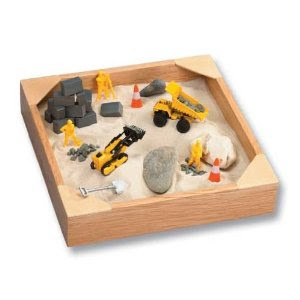 Big Builder includes: 10"X10"X2" wooden sandbox, 10"X20" no mess play mat, ultra fine sand, 2 die cast construction vehicles, mini boulders, bag of gravel, sefety cones, digging shovel, construction cres and builder blocks! They also carry a very fun Executive Sandbox line for that 'Boy Dad' you know and love! 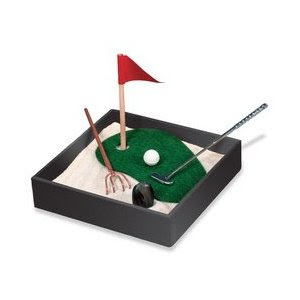 The Tee Time includes 5.25"X5.25" sandbox, ultra fine sand, putter, 1 flag, putting green, 1 mini golf ball, 1 grooming rake, and 1 bunker stone! 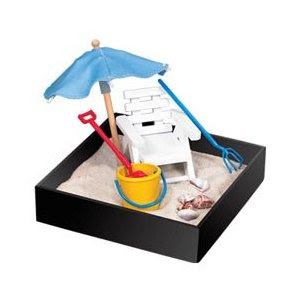 Beach Break includes 5.25"X5.25" sandbox, ultra fine sand, 1 beach chair, 1 digging shovel, 1 sand pail, 1 grooming rake, 1 sun umbrella and seas shells!